This is a public service announcement on Earth Patrol. Know your rights or at least a couple of skate related events going down this weekend. 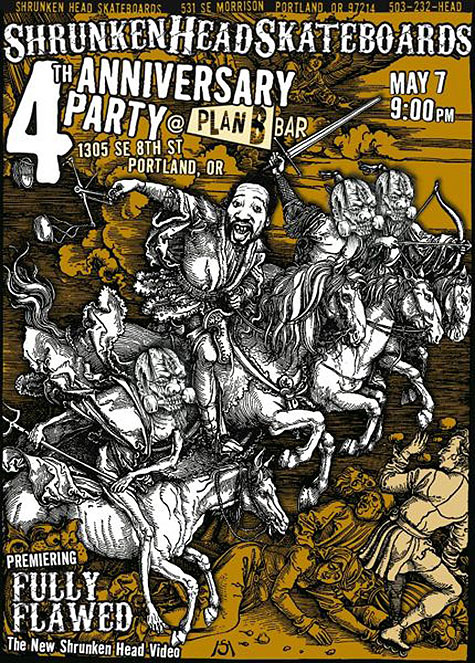 First up is tonight’s premier of the Shrunken Head video “Fully Flawed” at Plan B. The actions starts around 9 p.m., see a larger flier after the turn. For you cone dodgers, don’t party too hard because on Saturday the West Linn Skatepark slalom is set to go off. Remember, arrive early to get some practice runs in prior to the 11 a.m. start time. EPM “Happy 4th Anniversary to Shrunken Head” Out! Movie was awesome. Huge turnout. Congrats Justing and Mike!